Based on reviews from 97 experts and 9,526 users. 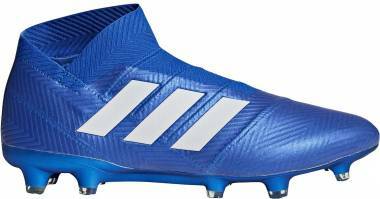 Learn how our rankings work or see our guide to blue football boots. Updated Apr 2019. In 1970, the taboo on colored football boots was finally broken when Alan Ball, a player from the England team donned a pair of white football boots in the Charity Shield for Everton. It happened in an era when black was the only acceptable color in the pitch. The bold marketing move of painting Ball’s Adidas cleats into white was masterminded by Hummel, a sportswear company. It was their way of getting the world’s attention, and it paid off with a twelve thousand-pair purchase the Monday after the game. The succeeding years after that, a plethora of colored football boots became widely available in the market. Soccer shoes of all sorts of prints and colors were a fad. Blue football boots, for one, were widely favored and its serene nature is to be blamed. Whether it’s your favorite color or not, blue is easy to love. It is often associated with loyalty and trust. It exudes focus and calmness which are two driving forces especially needed in sports. Legendary football icons such as Messi, Ronaldo, and Neymar have worn blue football boots. Even their signature cleats were frequently designed with the influential hue either as a base color or as an accent. The “Written in the Stars” Mercurial Vapor is Neymar’s first ever signature edition cleats. The blue football boot is literally meaningful as each design element represents his personal story. The vibrant blue orbit palette with volt accents is symbolic of his home country, Brazil. Signifying his career success are the unique constellation graphic strategically arranged to display his favorite goals. This blue football boot is packed with some of Neymar’s favorite numbers symbolizing birthdays of his loved ones and memorable dates of his career. The Blue Blast Pack showcases Adidas top silos in a dominantly blue upper with a touch of solar pink, solar orange, and white. The color range was worn by football stars Messi, Suarez, and Ibrahimovic. 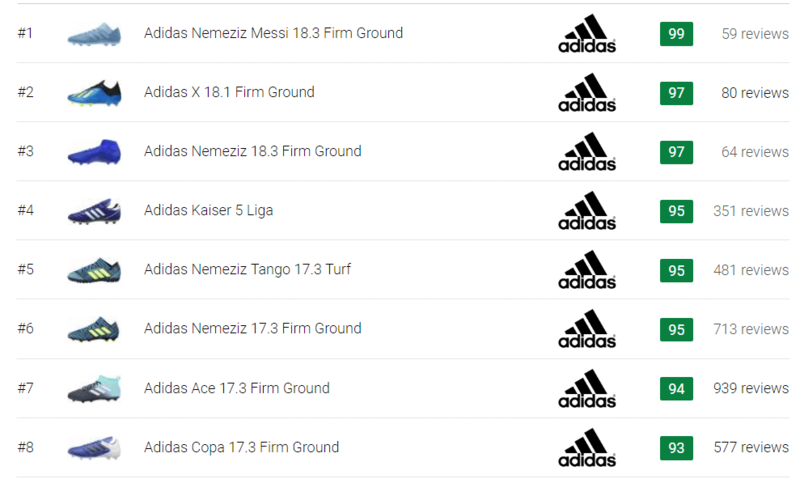 The high-tier Ace 17+ FG, X16+ PureChaos, Copa 17.1 FG and Nemeziz Messi 17+Agility are all part of the color collection. 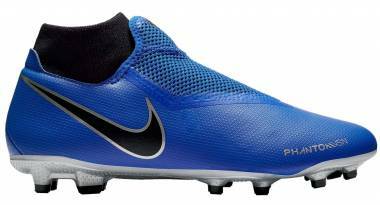 The blue football boots were released in January of 2017. The legend ink and energy blue composition of this colorway truly represent the tranquil yet mighty ambiance of the ocean. The signature stripe design of the Nemeziz line was made even more striking with the mixture of the contrasting palettes. The Adidas stripes add up to the energy with a vibrant volt hue. Messi, Firmino, and Draxler were the main models of the lineup which includes all the Nemeziz football boots and sneakers. One of the few football silos of New Balance was paraded in a refreshing Maldives Blue palette in January of 2018. The blue football boot was launched together with the contrasting Hi-Lite silhouette of the Furon 3.0 FG. The blue football boot is paired with a bright Hi-lite soleplate and NB branding. It also features a black Hexaprene control on the heel side. The second generation Visaro Pro is worn by prominent players such as Aaron Ramsey and Yohan Cabaye. A classic hand-crafted black football boot has always been synonymous with Mizuno. However, it does not stop them from producing colored soccer cleats that are of equal quality. The second generation of the Mizuno Morelia Neo in Blue Atoll - Blue Depths colorway was launched in December of 2017. The icy color mixture brings a soft and calming hue to the strong contender in firm ground boots, the Made in Japan Morelia Neo. 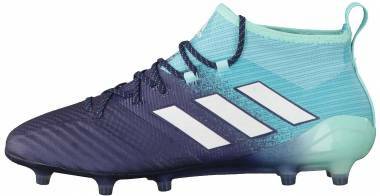 What makes this blue football boot a stand-out is not just its tantalizing palette but its lightweight composition which weighs at 6.3 ounces. 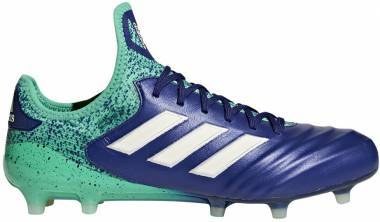 Here are some examples of notable blue football boots for women. Following the release of the Spark Brilliance Pack for men, a women’s version of the collection was launched for the Rio Olympics in 2016. Most of the boots are dominantly white but are tainted with blue and red accents, inspired by the American flag. 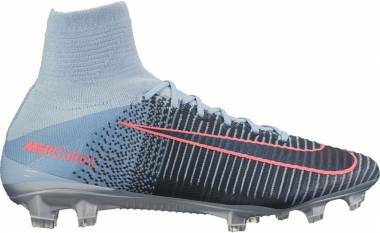 The stand-out blue football boot from the white palette-lineup is the Mercurial Superfly V which is wrapped in blue Speed Rib stripes and blue collar. The special edition signature Superfly was designed to commemorate the success of the Dutch footballer, Lieke Marten. 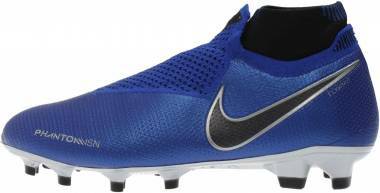 The blue football boot has a silver soleplate and a dominantly blue upper. The lioness icon on the heel and the orange palette on the Swoosh were significant symbolism for her team. With the launch of her signature cleats, she hopes to influence younger girls to be more inclined to football. A game changer color scheme for women’s football was released in 2018 highlighting the tracer blue and core black palettes. 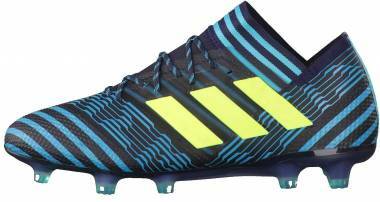 The dark blue composition was featured in Nemeziz 17.1 FG and Nemeziz 17.3 FG. The trademark Nemeziz stripes are subtly displayed in a glossy dark accent while the red zest Adidas stripes stand out on the lateral side. The bold colorway was launched together with the champagne red Predator 18 for women. Blue is considered to be the color of the mind. It has been proven, through studies that the calming hue can stimulate us mentally. Its soothing nature help increase focus and consequently, intelligence. Sporting those blue football boots on the pitch may help you win the game by activating those brain cells. You’ll never know the strategies you can formulate while sporting those blue cleats! Darker blues bring clear thoughts while softer blues exude calmness. Whatever part of the blue spectrum it belongs, it will surely do a great job in keeping your cool in your games. For lesser chances of a yellow card or red card caution, blue is a perfect choice. 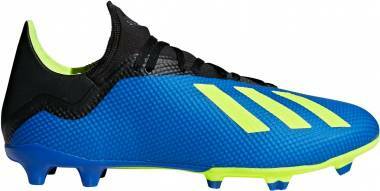 Blue is one of the top-scoring colors for a football boot in the Premier League, next to white and black. The relaxing hue just can’t seem to relax in the field as it produced several goals including Wayne Rooney’s eight goals in one season a few years ago. He was wearing a blue Nike T90 football boots. The stats clearly show how blue football boots can influence your strikes! What do the numbers in Neymar “Written in the stars” football boot represent? The constellations represent his six favorite goals. Is Neymar “Written in the stars” blue football boot a limited edition? 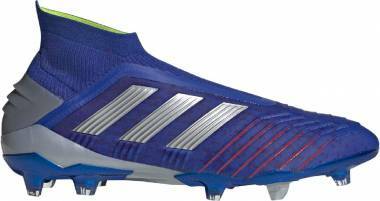 The blue football boot is a special edition silo but the distribution is not limited. Additionally, standard sizes are available for the Firm Ground, Turf, Indoor and Junior versions. What jersey or knee-sock colors are best paired with blue football boots? Players can still look sleek and fashionable even on the pitch. Following simple color guidelines won’t hurt if you’d like to look as presentable as possible in your stressful games. Contrasting colors such as yellow, neutral, brown, white and green are the commonly suggested colors that can best match blue football boots. Avoid overmatching by not mixing up your blue football boots with any shade of blue. Can I use a bleaching agent to wash my blue football boots? Avoid using bleaching agents when caring for your blue football boots as it may cause discoloration. It is always safe to follow the care label attached to the football boot. Are blue football boots expensive? When it comes to football boots, the color is usually not a good indicator of its value. Whether it’s blue, gold or silver, the color palette will never tell us the price. In general, special edition or limited-edition football boots are more expensive. Additionally, football boots with more advanced technologies such as in the high-tier models of each brand, the rate is typically much higher. 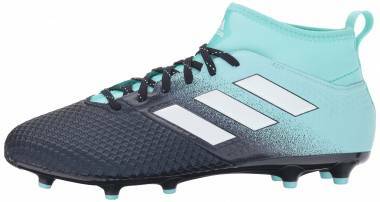 For instance, the Adidas Predator 18+ FG is $215 more expensive than the low-tier Predator 18.3 FG because it features high-quality, expensive technologies such as the Primeknit upper, Boost cushioning, Controlskin, stretchy sockfit and ControlFrame soleplate. The Adidas 18.3, on the other hand, only features Primemesh upper, Control embossing, and a TPU outsole. In short, the Predator 18+ is the more costly version of the Predator 18.3. However, that does not mean that the 18.3 is low-quality. It still undergoes intense quality control to ensure your comfort and performance.